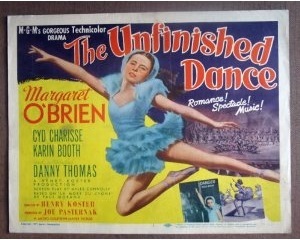 In the publicity heralding the DVD release of MGM’s 1947 ballet film, The Unfinished Dance, much was made of the movie’s similarity to a more recent film of balletic trauma, the 2010 Black Swan. As everyone who’s seen the latter film knows, the story follows the plight of a young soloist (Oscar-winner Natalie Portman) losing her mind as she struggles to reach her “dark side” for the role of Odile in Swan Lake. The movie pretty much ignored Odette, the White Swan—if you’re not familiar with Swan Lake, you might think, after watching the film, that the role of Odette was small potatoes—though the ballet’s duality is reflected not only in Portman’s character’s inner conflicts, but in her rivalry with another dancer for the ballet’s lead. The film does make a point about what ballet requires from its artists: It’s a brutally hard business, physically, mentally, and emotionally. But in its depiction of its protagonist’s dissolving sanity, Black Swan turned from overheated melodrama into sheer horror. Portman’s dancer doesn’t merely go mad; her persona, in schizophrenic excess, shivers apart, spilling her core fears onto other characters and events (you’re never sure if what Portman sees is actually happening). Even her body splits open, mutating into something unhuman, her skin gashing, and then, in a graphic form of body horror, sprouting pinions. In the end, Portman’s efforts to master Odette/Odile cost not only her reason, but her life. While The Unfinished Dance doesn’t approach anything near the horrific overkill of Black Swan (those rushing to buy the DVD hoping to see Cyd Charisse turn into The Picture of Dorian Grey will be disappointed), it does have the usual doses of madness, morbidity, and mashed toes of other films that focus on the lives of ballet dancers and on ballet as a way of life. Probably the definitive statement on the ballet film comes from Arlene Croce, the former and much-respected New Yorker magazine dance critic. She famously described the genre as being in “the tradition of morbidity,” which not only “aroused tremendous popular interest in ballet,” but also “raised the status of ballet in the movies at the same time.” Indeed. Audiences, it seems, want their doomed ballerinas. Films like Waterloo Bridge (1940 version), Specter of the Rose, The Mad Genius, Limelight, Gaby, The Red Danube, The Story of Three Loves (“The Jealous Lover” episode), and The Men in Her Life, says Adrienne McLean in Dying Swans and Madmen, her study of ballet and cinema, offer images that associate dance with “agency, joy, and fulfillment” on the one hand, and “perversity, melancholy, and death” on the other. The grand swan, as it were, of this tradition is Powell and Pressburger’s overwrought 1948 Technicolor masterpiece, The Red Shoes, which Croce calls “a horror story told in the form of a dance musical, with dance supplying the main thrills.” Along with its title and its protagonist’s red hair, The Red Shoes self-consciously labeled itself with the Scarlet A for Art, both in its frequent snippets of well-known ballet classics (Giselle, Swan Lake, Les Sylphides), and in its incorporation of an original, twenty-minute ballet created especially for it. It all ends sadly, with Moira Shearer plunging off a balcony—in a swan dive, of course. Although many ballet films do end with the main character’s death (Sanjoy Roy came up with a list of morbid motifs in ballet films, slotting The Red Shoes into the “In the end she dies” category), there’s also the murderous-rivalry tradition, in which dancers compete like gangsters for turf for a coveted lead role. TUD’s innovative twist on this category is to add a child into the mix. 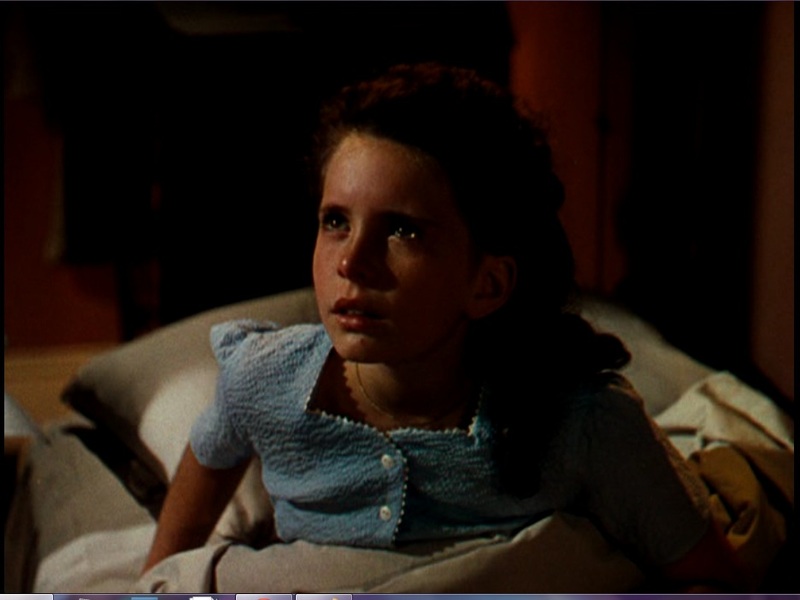 Moira Finnie notes the “disquieting effect” this addition has, comparing TUD’s youthful protagonist, played by child star Margaret O’Brien, to the nasty children of The Bad Seed and The Omen. And the effect really is disquieting, particularly as embodied in O’Brien’s neurotically intense performance. She’s Meg Merlin, a young ballet student at a combined ballet school/dance company, who adores, with an almost pathological ardor, Ariane Bouchet (Charisse), the company’s lead dancer. Meg follows Bouchet around like an unwanted puppy, hysterically defending her idol from the snide put-downs of another young student (Connie Cornell), even to the point of physical combat (the director, Henry Koster, stages this incident as a catfight, which only augments the film’s perversely disquieting effect). When management invites La Darina (Karin Booth), a famous ballerina, to dance as a guest artist, Meg senses Bouchet’s dejection and plans to humiliate Darina during a performance of Swan Lake. Her idea is to turn off the light switch, so that Darina, forced to dance in stage darkness, will be mocked by the audience. Instead, Meg accidentally throws the switch to the onstage trap door, which lowers just before Darina traverses the space above it. Her career-ending injury causes poor Meg no end of guilt and remorse, leading to what Finnie calls a “meltdown the size of Radio City Music Hall.” However, the happy ending eventually comes round, as Darina forgives Meg with an almost saintly forbearance (“nobody is to blame,” she inanely remarks) and dedicates herself to furthering Meg’s career. 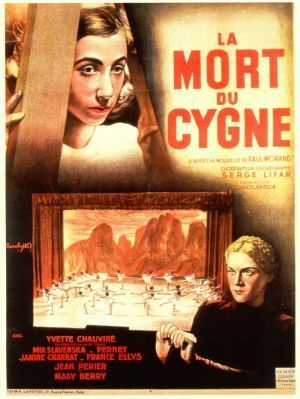 TUD was a remake of a 1937 French film, La Mort du Cygne (American title: Ballerina), which, like the later film, is about a young student who causes a devastating injury to a dancer in order to, as she sees it, protect another dancer she admires. This film has gained a legendary aura, in part for having been thought of as a lost film for many years. Per McLean, MGM, in preparing for its remake, bought up the rights to LMDC and then removed it from circulation, so it would offer no competition to its own product (a print was not discovered until the year 2000). What’s noteworthy about this film is the casting of three renowned classical dancers, Janine Charrat, Mia Slavenska, and Yvette Chauviré, in the leads. Charrat, who was about thirteen at the time and plays the child (here called Rose), was something of a prodigy (she choreographed her first ballet, on herself, at age fourteen), and would go on to a long career as a dancer and choreographer. Slavenska and Chauviré were both celebrated ballerinas from the 1930s through the 1960s: Slavenska (in the Booth part) was an international star, who at one point ran her own company; while Chauviré (in the Charisse role) was a famed étoile of the Paris Opéra Ballet, and is considered France’s greatest classical ballerina (she’s also a legendary Giselle). For balletomanes, LMDC is simply a must-see; both Slavenska and Chauviré dance with a precision, authority and lightness that, even by today’s standards, are astonishing. Chauviré has wonderful ballon and a regal poise (her upper-body work is particularly beautiful), while Slavenska dances with a loose-limbed sensuousness that makes her look extraordinarily modern; she would look right at home in ballets today. In spite of superficial plot similarities and some minor changes (Chauviré chooses marriage over career; Charisse decides to continue dancing), the differences between LMDC and TUD are profound. While MGM tried to soften the girl’s vengeful action by making it ‘accidental,’ in the French version she deliberately knocks away the support beneath the trap. Yet Rose, although fearful of exposure, does not endure the tortures of the damned for what she did. Unlike MGM’s Meg, who remains lonely and isolated in her guilt, the scrappy and aggressive Rose allies herself with the other ballet children, who view themselves as opposed to the adult world. 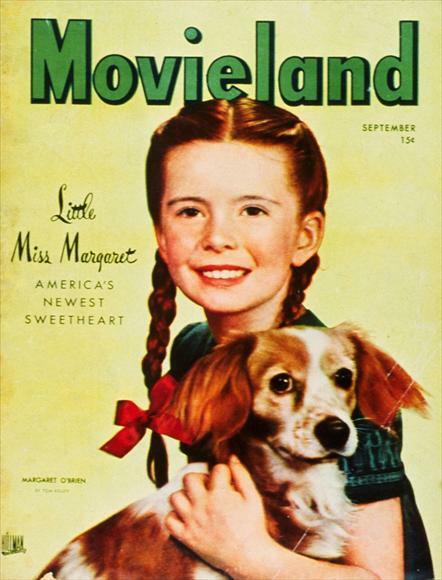 “Whenever you get mixed up with grown-ups,” says one sage youngster, “there’s trouble.” Whereas Meg’s dilemma gives O’Brien an opportunity to display, in huge close-ups, variations of angst, sorrow, and misery that would have done Norma Shearer proud. O’Brien is actually quite good at running such a gamut; but she seems to be enacting a children’s version of the ‘woman’s film,’ the kind, as described by Dwight MacDonald, in which “the spotlight is on the heroine’s feelings, which are always intense and complex.” As a woman’s film, TUD gives us a picture of childhood that’s both dark and maudlin, in which little girls wallow, like miniature divas, in enough suffering to fill several seasons of opera. The French film, in contrast, is content to let the children be children, behaving like the unsentimental little savages that they are. Slavenska (right) confronts Charrat (left) in a scene from La Mort du Cygne. Note the classroom with students in the background. The greatest difference between the two films, however, is how dance relates to their characters’ lives. Significantly, LMDC begins with shots of the Paris Opéra façade, where the story takes place. The Ballet of the Paris Opéra is the oldest and one of the greatest dance academies and companies in the world. By consciously linking his movie to this famous school and troupe (its corps de ballet appears in the film), the director, Jean-Benoit Levy, also linked it to centuries of ballet tradition—to the very origin of ballet itself. The film begins and ends during class; after the credits it opens on a line of students at the barre, performing a series of perfectly executed grands ronds de jambes, their long, strong legs slicing through space. Throughout the film, we are given scenes of dancers in class, backstage, in dressing rooms—turning, leaping, stretching, bending, flexing feet, adjusting shoes and tutus. They are very much of this self-sufficient, all-consuming world, one that commands a religious-like devotion (before a dance exam one student intones, “Terpsichore! Come into me!”). The injured dancer, here called La Karine, cannot forgive Rose for what she’s done (discovering the truth, she threatens Rose with reform school), but she is moved to teach the girl after observing her dance. In spite of hobbling with a cane, Karine can still ‘feel’ the dance as she watches. Similarly, Rose, even when lowering the trap, finds herself moving her arms in rhythm while watching Karine dance; she can’t help but be caught up by the beauty of the movement. Karine and Rose are brought together, not by love and forgiveness (as are Darina and Meg), but by a harmony of mind, music, and muscle—by the Dance itself. “The Dance,” Karine tells Rose, “is greater than all our personal troubles.” The older dancer will make the younger one the ballerina she could have been, to carry on the tradition. In contrast, the star performer is the focus of TUD, which opens and ends with star turns. Given that MGM made the film as a star vehicle for O’Brien and, to a lesser extent, Charisse (they perform one number together), it’s not surprising that most of the dancing focuses on these two. 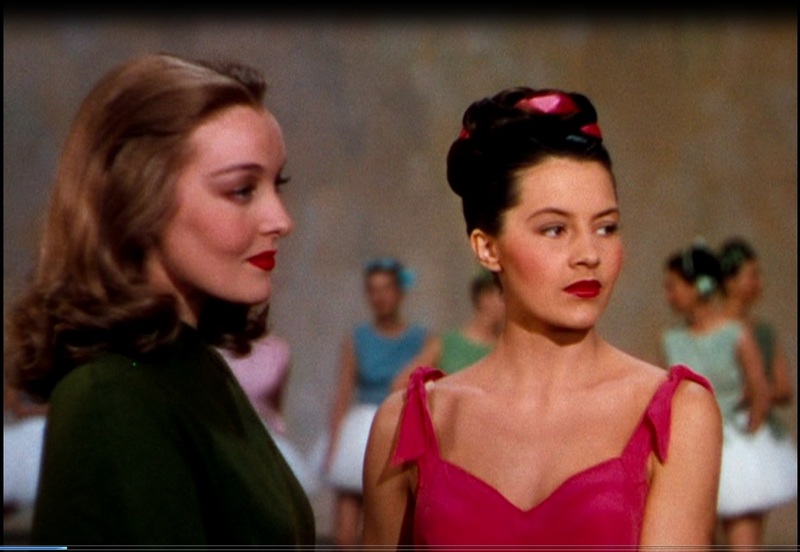 The opening scene shows an adoring O’Brien watching Charisse rehearse, and the last has Charisse and Booth cosseting O’Brien before she races onstage to perform a brief solo in the closing dance number (whereas LMDC ends with Rose being absorbed back into class, with other students). Notions of the glorious tradition of ballet have little stock here. Rather, the film seems focused on proving that O’Brien could dance. 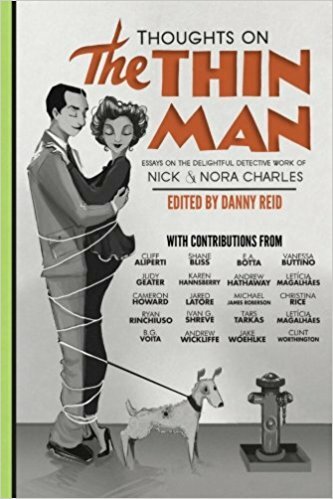 In his New York Times review Bosley Crowther snarkily wrote that O’Brien is “trotted out often to poise on her hastily tutored toes,” and several scenes have O’Brien strapping on a pair of toe shoes and bobbling back and forth on pointe, pausing occasionally to lunge into arabesque. Although the adult O’Brien has spoken in interviews of extensive dance training from her earliest days, she’s really no more than adequate in the film (McLean quotes MGM pressbooks publicizing how O’Brien trained for six months before filming). She and the other children lack turn-out, which makes their movements look imprecise and vague; and they also look uncomfortable and unsure on pointe. O’Brien’s own dancing lacks rhythm; she doesn’t link steps in a liquid phrase of motion, but moves from one to another as if waiting for the camera to register each pose. It may be unfair to criticize O’Brien’s capabilities here (she was only about ten years old when she made the film), but the film’s premise, that she’s an unusual talent deserving of nurturing, seems something to be taken on faith alone. If our own judgment on O’Brien seems a bit snarky, our defense is having seen the children of LMDC. True, those children were being trained in a unified style and tradition, to become professional dancers (and were probably a few years older), whereas the MGM children look like (and probably were) a group of pick-up performers. This also seems true of TUD’s older dancers. Even in a scene where they’re shown warming up for class, they don’t look like ballet dancers in the Paris Opéra sense, but more like dancing girls with ballet training; they don’t carry themselves like ballet dancers. (If Lucille Ball’s Bubbles from Dance, Girl, Dance happened to saunter by in her full boa-and-beads glory, we wouldn’t have been surprised.) The only real ballet dancer in the film is Cyd Charisse (a double danced for Booth in her performing scenes). 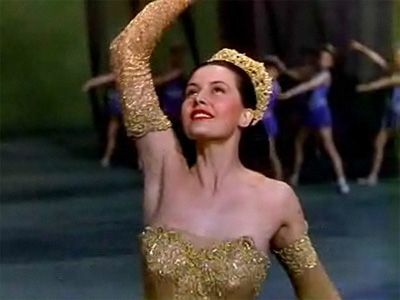 We’re pointing out the obvious in noting that Charisse was a fabulous dancer; any one of her MGM musicals, particularly those with Gene Kelly or Fred Astaire, is ample enough evidence. She also had real ballet training (her teachers included Bronislava Nijinska and Adolph Bolm), and had danced ‘ballet’ in other films (Meet Me In Las Vegas, The Band Wagon, Black Tights). Big, healthy, technically secure, Charisse has a flexible back, muscular legs, and whip-like turns; her dancing is equally big and muscular. She moves with vigor and force, with a full-out attack, holding nothing back. Sometimes almost too much force; she’s not so much a Swan as an Amazon, her body projecting into space like a missile. She looks best in TUD’s ‘jazzy’ numbers, such as the “Holiday For Strings” finalé, where the sharp, angular thrusts of the choreography favor her bold, rangy style: Clad in black tights and leotard slashed with neon pink, she’s as lithe and agile as a panther. Much of the film’s choreography has that same ‘modern’ look—fast, sharp, and angular, with dancers composed into swift-moving blocks of energy. The choreographer was David Lichine, whose best-known ballet is Graduation Ball, a sweetly comic piece about boys and girls and their confused emotions at encountering each other at the title event (albeit it’s danced by adults). Even though Lichine choreographed for children in TUD, nothing he set on them is about ‘being’ children, like his aforementioned ballet (nor is anything like the children’s “Ballet of the Bees” in LMDC). Instead, Lichine interweaves children and grown-ups in the same piece, with lines of young girls crisscrossing lines of adults; then Charisse bounds out, traversing both groups with space-swallowing leaps. His work in TUD isn’t bad, and he had a definite talent for arranging contrasting clusters of moving dancers. Although TUD was made by MGM’s Joe Pasternak unit (both Pasternak and Koster, who had guided Deanna Durbin’s career at Universal, were experienced in working with children), its dance sequences seem more akin to the work of the Arthur Freed unit: The combination of brightly colored sets and costumes (brilliantly highlighted by Robert Surtees’ Technicolor cinematography), sweeping throngs of motion, and mobile use of the camera anticipate Gene Kelly’s choreography for An American in Paris and its use of dancers rushing en masse across the screen. The total effect, though, does tend to look more MGM than Maryinsky. The crucial dance in TUD is its Swan Lake piece, during which Darina is devastatingly injured. The ballet as presented here is a pastiche of the second and fourth ‘white’ acts, including Tchaikovsky’s music from both. 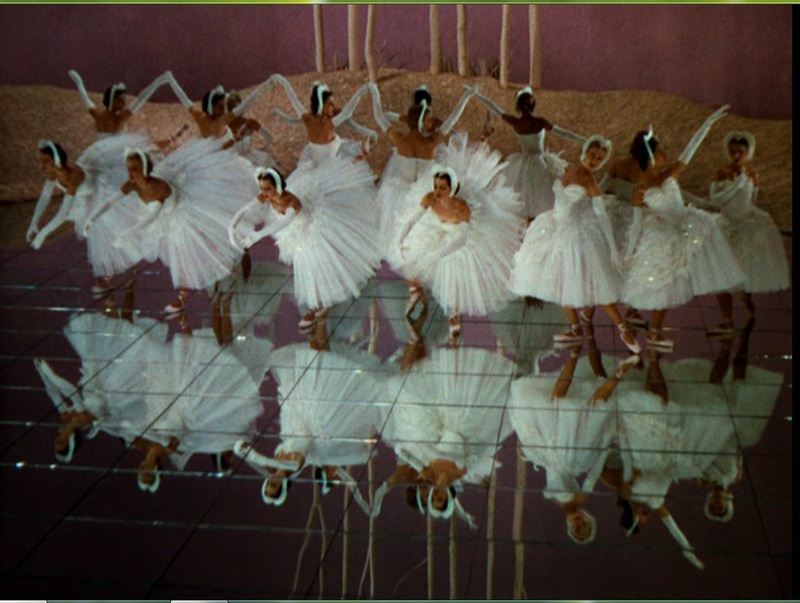 Its use of a mirrored floor, reflecting the white-clad dancers as they bourree across the stage in long, interlacing lines, creates an ethereally beautiful effect, as if the swan maidens inhabited a cloistered, otherworldly realm—perhaps a metaphor for the perceived life of the ballet dancer, as one outside the ‘normal’ range of existence. The choreography for Darina is not as effective as in Lichine’s other pieces (and often looks downright bizarre), as Darina (Booth’s double in the long shots) jumps, whirls, and hurtles through space in a mélange of what McLean calls “cheerleader moves” (at one point she drops to all fours and kicks a leg up backwards, a move suited more for Vegas than for a classical tutu). McLean criticizes the piece for trying to jack up the tension surrounding Darina’s fall, noting how the cutting between the descending trap door, the intent spectators, and Darina onstage spinning in endless chainé turns, is “directed at creating suspense about the exact dispensation of disaster,” which “turn[s the sequence] into the equivalent of a girl tied to the railroad tracks.” But one can argue that the anticipation of disaster is the point of the ballet film; it’s a genre in which, as McLean herself wrote, “ballet and being a ballet dancer are equated with tragedy and death.” If, says Sanjoy, “ballet dancers in feature films have consistently been associated with hysteria, madness, torture, the supernatural and death,” then it fits that Darina’s catastrophe would, as McLean writes, come across “as extreme a rendering of an old-fashioned melodramatic moment as exists in any ballet film.” Morbidity in ballet movies is to what the horse is in Westerns; it comes with the territory. What’s also territorial to the ballet film is Swan Lake itself. 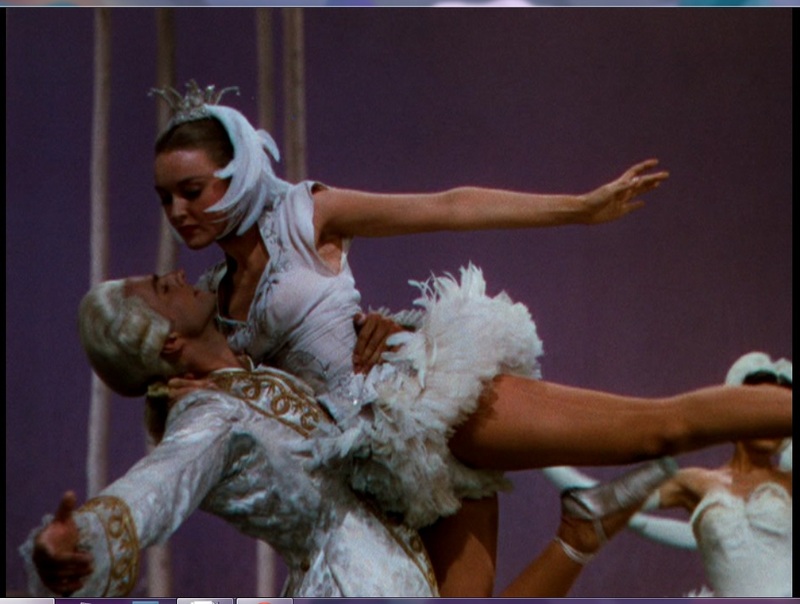 Tchaikovsky’s ballet appeared in a number of ballet films (in various choreographies) before Black Swan; the protagonists of The Red Shoes, Waterloo Bridge, I Was An Adventuress (1940), and Never Let Me Go (1953) perform cinematic versions of it (the music from the second-act overture is also heard during the opening credits of several early-1930s horror films—perhaps another link to the morbid). Swan Lake, and the swan image, have become so iconic that they may equal ‘ballet’ for many spectators, the way the image of a swatting Babe Ruth may equal ‘baseball’ for sports fans. McLean traces how the swan image came to represent the female dancer via Anna Pavlova and her celebrated dance, “The Dying Swan.” Pavlova and her swan solo were well-known in America in the first third of the 20th century; she traveled the country performing it everywhere. But Pavlova was tapping into an even older tradition, not only of Swan Lake, but of the tragic Romantic image of the ballerina, what McLean calls “an inhuman, delicate, and dangerous creature with wings.” The Romantic ballerina’s sad fate, in such works as Giselle, La Sylphide, and La Bayadere, as well as Swan Lake, extends to her cinematic avatars, whose destinies, says McLean, “reproduce[ed] those of the sylphs and swans they presumably portrayed on the stage.” The heroine of Swan Lake is doomed, either to remain in her enchanted swan state or to die; and ballet film protagonists who choose this particular avian image frequently end up just as badly. Certainly the ruinous accidents that befall both La Karine and La Darina of LMDC and TUD evoke the unhappy fate of the balletic swan. The very title of LMCD (which translates literally as “The Death of the Swan”) symbolizes an unfortunate ending, as well as alluding to both Swan Lake and Pavlova’s “The Dying Swan.” Although Swan Lake proper is not performed in this film, Karine’s injury happens while she is dancing a piece called “La Mort du Cygne,” in which (in a manner suggestive of Swan Lake) a swan maiden is shot by a hunter and dies. And both Swan Lake and “The Dying Swan” are referenced directly in TUD: The credit sequence is underlined by the opening strains of Swan Lake’s second-act overture, which then segue into Saint-Saëns’ “The Swan” (the music for Pavlova’s famous solo), played with full-out lachrymosity. Not only is Darina’s performance in Swan Lake milked for the last drop of drama (in close-ups Booth has her head thrown back, her throat exposed, like a swan offering its neck to the axe), but the ballet’s second-act overture can be heard during tense encounters between Darina and Bouchet, hinting at its White Swan/Black Swan dualism (Booth’s pale blonde contrasted against Charisse’s dramatic brunette coloring heightens the effect). As with other ballet films (e.g., The Red Shoes, Waterloo Bridge), TUD’s ballet story serves as a meta-narrative for its filmic one. But Swan Lake is more than a reference point in TUD. It’s the film’s object of desire. The contest between Bouchet and Darina is not for a ballet prince but for—well, for the role of the Swan. 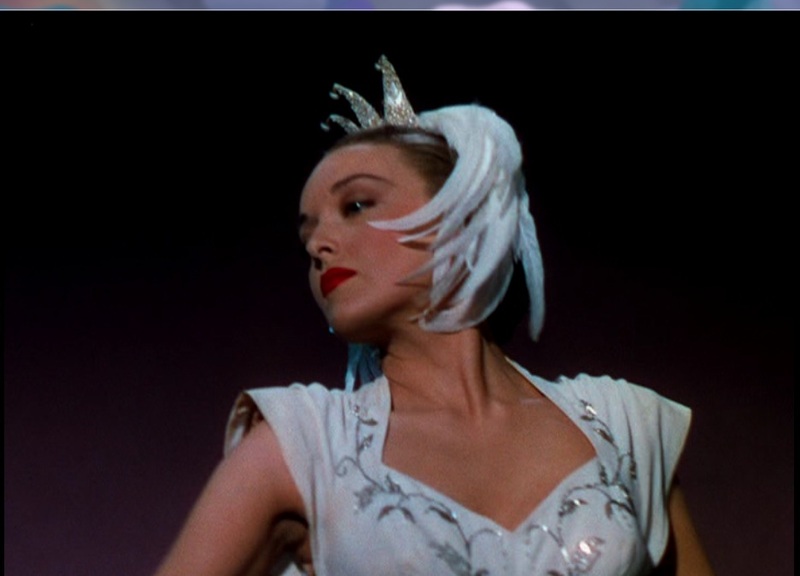 The movie’s first scene has Bouchet rehearsing a long solo from the ballet, whose lead is then given to the visiting Darina; right after the latter’s injury the manager (blustery Thurston Hall) asks Bouchet if she can perform Swan Lake the following night. “I’m the prima ballerina now,” she triumphantly tells Meg. Bouchet has her own small conflict in the film, whether to dance or to marry. However, her decision to discard her wealthy fiancé (Charles Bradstreet’s only purpose in TUD, it seems, is to buy Charisse lot of fashionable clothes that she can model for the film’s audiences) to get what she really wants—ballet stardom—doesn’t end in madness and despair. Unlike many ballet films, in which, as McLean remarks, “the desire ‘to dance’ is itself toxic” (recall Shearer hurling herself off that building), wanting to dance is the happy ending in TUD. The film closes with Bouchet starring in a new ballet and a misty-eyed Darina smiling with approval. Indeed, everyone ends up smiling, even the morose Meg. McLean notes how TUD “comes down on the side of a woman’s career over home and family,” a notion that the film’s final image expresses in dance terms, with the ballerina flanked by her corps. But TUD does something more radical. It takes the ballet film’s central trope of morbidity and turns it on its head. Swan Lake may kill you, but it can also give you joy and fulfillment. “If a dancer can’t dance anymore,” Meg exclaims at one point in tones of hushed terror, “she just dies.” So TUD makes sure that its dancers will live. If Swan Lake can be viewed as a compressed synonym for the whole of ballet, then the desire to dance this ballet can be extended to the desire itself to dance. And there’s nothing morbid about that at all. >>PROGRAM NOTE: The Unfinished Dance and La Mort du Cygne (under its American title Ballerina) are scheduled to be shown on Turner Classic Movies on Monday, Sept. 19, 2011, at 2:00am and 3:45am respectively. LMDC is not on DVD. Visit http://www.tcm.com for more information.